CC Connected is an on-line community of home-educators who discuss ideas on Forums, share ideas through File Sharing centers, and have access to a rich Learning Center full of videos and downloads that help parents become better educators. Most members of CC Connected are also members of a Classical Conversations community who are enriching their students’ studies at home and continuing their own education. We offer a free guest forum and learning resource center. All you have to do is register and you will have access to some great tools to help you get started in classical Christian education. The Scribblers Tier contains tutorials, printables, activities, and ideas for the littlest learners. Activities cross a broad spectrum of subjects from science to geography to phonics to math to poetry. The resources and activities that comprise the Scribblers At-Home Program help hone fine motor skills, develop basic literacy, reinforce Foundations memory work, and teach children about truth, goodness, and beauty. The Foundations Tier offers great resources for learning in the grammar stage including the Classical Acts & Facts History Card timeline with hand motions. Forums connect you with other Foundations parents around the world, and the File Sharing gives you access to activities created by Foundations tutors and parents that you can print off and use at home, or share your own ideas with others! PLUS, a special area for students: online tutorials provide interactive memory work review for Cycles 1, 2, and 3 with audio and visuals. The Essentials Tier offers video tutorials that help you teach English grammar at home. Short videos break down the topics so that you can learn the essentials before you teach them. Also tips for how to organize a student notebook and why we do what we do in Essentials class! Writing center offers more guidance on teaching writing and the math section offers the complete text of Tables, Squares & Cubes, a resource known by experienced CC parents as, "The absolute best way to learn multiplication tables!" Enjoy access to forums with Essentials tutors and parents to get answers to the trickiest questions. On the File Sharing center, you’ll find ideas for extending the lessons at home and extra sentences for practice. The Challenge Tier complements your Challenge seminar at home with video tutorials in Latin, math, and writing. You can learn from experienced Challenge tutors and educators such as Andrew Kern in our Learning Center. Forums connect you with Challenge parents and tutors across the nation and the file sharing gives you access to additional helps created by parents for their own students. "It is wealth of information that helps me be a better educator all the way through high school!" Community members receive substantial discounts for membership. Join us today! Your family's at-home learning center supporting parents the other four days of the week. Classical Conversations communities meet once a week, but as a homeschooling parent, you educate every day. CC Connected offers the help you need at your fingertips anytime you need it. It provides a wealth of resources and a community of experienced Classical Conversations parents to help you reclaim your own education as you create a unique and wonderful education for your children! CC Connected offers an open “free” area for all parents, in addition to valuable subscription areas by program. Click Here for a sampling of what CC Connected has to offer. 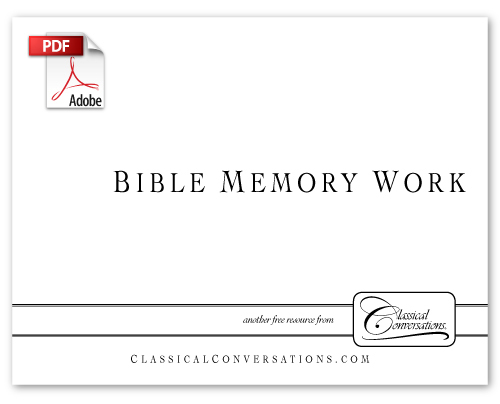 Click the image at left to download this FREE Bible Memory Work guide for all 3 cycles! You agree and acknowledge that Classical Conversations, Inc., a North Carolina corporation, and its affiliates (“CC, Inc.”) assume no responsibility for the actions or content of the Site. You further agree and acknowledge to hold CC, Inc. harmless for any harms or liability suffered by you and to indemnify CC, Inc. for any harms or liability resulting from the Site. The Site currently provides users with access to ­­­­­­­­­­­­documents and files created and maintained by Classical Conversations. You also understand and agree that the service may include certain communications from the Site such as Classical Conversations’ promotional events, service announcements and administrative messages and that these communications are considered part of the Site membership and you will not be able to opt out of receiving them. Unless explicitly stated otherwise, any new features that augment or enhance the current Service, including the release of new properties, shall be subject to the TOS. You understand and agree that the Service is provided "AS-IS" and that the Site assumes no responsibility for the timeliness, deletion, mis-delivery or failure to store any user communications or personalization settings. Full refunds will be given for all subscriptions of three or more months in duration when the subscription is cancelled within 30 days of start of subscription. Please note that we plan our staffing needs according to registrations in order to provide a safe, structured learning atmosphere for our students. You may cancel your registration up to one month (30 days) before the event and receive a full refund. Should you not be able to attend for any reason after that time your registration is transferable to another practicum during this summer's practicum season in 2018, but not refundable. The transferable fees must be used to pay for a child in this family to attend another camp. Transferring to another camp is dependent upon available space in the camp. a. YOUR USE OF THE SERVICE IS AT YOUR SOLE RISK. THE SERVICE IS PROVIDED ON AN "AS IS" AND "AS AVAILABLE" BASIS. THE SITE EXPRESSLY DISCLAIMS ALL WARRANTIES OF ANY KIND, WHETHER EXPRESS OR IMPLIED, INCLUDING, BUT NOT LIMITED TO THE IMPLIED WARRANTIES OF MERCHANTABILITY, FITNESS FOR A PARTICULAR PURPOSE AND NON-INFRINGEMENT. b. THE SITE MAKES NO WARRANTY THAT (i) THE SERVICE WILL MEET YOUR REQUIREMENTS, (ii) THE SERVICE WILL BE UNINTERRUPTED, TIMELY, SECURE, OR ERROR-FREE, (iii) THE RESULTS THAT MAY BE OBTAINED FROM THE USE OF THE SERVICE WILL BE ACCURATE OR RELIABLE, (iv) THE QUALITY OF ANY PRODUCTS, SERVICES, INFORMATION, OR OTHER MATERIAL PURCHASED OR OBTAINED BY YOU THROUGH THE SERVICE WILL MEET YOUR EXPECTATIONS, AND (V) ANY ERRORS IN THE SOFTWARE WILL BE CORRECTED. d. NO ADVICE OR INFORMATION, WHETHER ORAL OR WRITTEN, OBTAINED BY YOU FROM THE SITE OR THROUGH OR FROM THE SERVICE SHALL CREATE ANY WARRANTY NOT EXPRESSLY STATED IN THE TOS.